Extending rail transit service to the Airport has been envisioned in both Airport plans and municipal transit plans for some time, as a means of providing a fast, comfortable connection between the Airport and the downtown core for visitors and residents alike. A separate branch line to the Airport was identified in the 2006 N-S LRT EA. Additionally, transportation studies prepared by the Airport Authority have identified significant delays for vehicle trips to and from the Airport at peak periods, due to a limited number of road access points and high levels of congestion on arterial roads in the area. Following the City's Economic Development Strategy Implementation Plan (2011), the City and the Airport developed a Shared Vision for Economic Development that was adopted by Council in 2012. This vision identifies several objectives that can be furthered by implementing high-quality rapid transit service to the Airport, including stimulating domestic and international business in Ottawa, attracting major events and conventions, and strategically developing employment lands to complement the City's existing employment land base. 1.1 I support the plan in general. 16 Comment noted. 1.2 The plan should be built as soon as possible. 9 Comment noted. 1.3 This plan is better than the 2004-06 version. 1 Comment noted. 1.4 It is extremely important that people begin to see transit as the preferred method of transportation (over single-occupied vehicles). We must adapt our cities to become less car-dependent and reduce emissions. 2 Comment noted. An objective of this study is to reduce car dependency by extending rapid transit services and fostering a greater transit mode share within the City of Ottawa. 1.5 This plan should be made compatible with an extension across the Ottawa River to Gatineau, potentially using the existing rail bridge. This should be built as soon as possible. 5 An extension to Gatineau is included in the TMP ultimate network, but not the affordable network. The current EA plan will not preclude a potential future crossing. 1.6 In the very near term, the line should be extended to Leitrim Station only. This could be done without shutting down the existing service and would require fewer stations, passing tracks, and trains, as well as less new track and new land. It would still provide significantly increased ridership from Hunt Club, Findlay Creek and Riverside South, while reducing the pressure on the Greenboro Park and Ride and making some Route 99 buses available for re-deployment elsewhere. 8 Council has identified the full extension to Bowesville as a key component of the priority Stage 2 rail plan. An interim extension to Leitrim could be examined as a staging scenario, dependent on funding availability. It is noted that in accordance with Transport Canada regulations, grade separations are required at all roadway crossings. 1.7 The line should be extended into Riverside South now, to better serve the community and allow new residents to use it as soon as they move in. 3 Work undertaken for the 2013 TMP update determined that an extension to Bowesville Station is the most cost-effective way of providing service to Riverside South to 2031. Rail transit cannot be extended into Riverside South using the existing diesel multiple unit (DMU) technology as it requires grade-separated road crossings, which are incompatible with Riverside South’s urban environment; cannot negotiate the tight curves along the transit corridor identified for Riverside South; and will result in significant noise issues for nearby residents. Immediate conversion to LRT is costly and not required to meet travel demand to 2031. 1.8 The line should be extended to Barrhaven Town Centre, as contemplated in the N-S LRT EA. 1 Work undertaken for the 2008 TMP determined that BRT was the most cost-effective way to meet travel demand between Barrhaven Town Centre and Riverside South Town Centre. The 2013 Barrhaven – Riverside South Rapid Transit (BRRT) study identified an LRT/BRT transfer facility in the Riverside South Town Centre. 1.9 The Study Team should consider having some trains run north to Bayview and turn east downtown. This will reduce the number of transfers. 2 The transfer at Bayview is required due to differences between diesel and electric LRT technology. This issue will be examined in the future, when the line is converted to electric LRT. 1.10 The plan should incorporate a single line serving the Airport, then running underneath the Airport to serve Riverside South. This would eliminate branching/transfers and bring the line closer to the population it is intended to serve. 5 This option was considered as part of the N-S LRT EA and not carried forward due to security and cost issues associated with tunnelling underneath the Airport. 1.11 The plan should be made compatible with transit service along the VIA tracks between Confederation and Barrhaven, or between Confederation and Kanata. 3 This option was examined as part of the 2008 TMP update and eliminated from consideration, as it introduces regulatory and scheduling complications and requires a significant number of grade separations. In addition, the location of the line does not adequately serve major ridership hubs. 1.12 The Study Team should consider building the line to use electric trains south of South Keys Station and having riders transfer to the diesel trains to go north of there. This would eliminate the need for grade separations at Lester and Leitrim and allow the line to be extended into Riverside South right away. This line could use the same vehicles as the Confederation Line. 2 This solution would eliminate the potential for direct service to both Bowesville and the Airport and would require the immediate construction of a new maintenance and storage facility south of South Keys, likely near Bowesville Station. In addition, this solution would complicate the design of South Keys station, where space is limited. 1.13 As the proposed Trillium Line will pass very close to the Rideau Carleton Raceway and potential casino, the study team should consider a short spur line to this destination. This might inspire more funding for the line from the province. 1 As the largest potential ridership identified in the TMP is expected to come from Riverside South, the line has been planned to turn towards this community. The potential ridership generated by a Casino is too low for rail service to be a cost-effective proposition. 1.14 Carleton University accounts for the highest volume of O-Train passengers and is already over capacity. Is the study team working with the University to see which areas will house more students? Easy access to the Airport should also be part of this planning. 1 Service frequency on the O-Train line has already been increased to accommodate high demand. The City and OC Transpo monitor ridership levels across the city in order to adapt service for high-demand locations and times. 1.15 The level crossing with the VIA Rail line south of Confederation Station is a safety hazard, as both Trillium Line and VIA frequencies increase. This crossing should be grade-separated to prevent a potentially serious rail collision. 1 The communications and signalling systems have been upgraded and integrated with VIA Rail as part of the recent Trillium Line service expansion. 1.16 The Trillium Line needs an internal road to service emergency evacuations from disabled equipment, with a fast response plan. 1 The parallel multi-use pathway will be able to provide emergency access. 1.17 The private service road leading to Ottawa South Pumping Station, off Alert Road, can be closed at the Alert end since it continues through to Albion Road. Alternatively, if use of the road is very light, it might be acceptable for vehicles to use the MUP along the east of the tracks from Lester. 1 This road is an Airport emergency route and cannot be closed at the Alert end. As the road cannot be closed and the MUP is an exclusive pedestrian and cycling route, vehicles will continue to use the road instead of the MUP. 2.1 Not enough information has been provided on EY Centre and Airport/NRC approvals. 1 The Ottawa Macdonald-Cartier International Airport Authority (OMCIAA) controls several parcels of land along the main line and Airport Link south of South Keys. As a partner in the project, they are closely involved in the study progress and have the opportunity to provide approvals in principle as required. Formal land use agreements are required at later stages of the project and will be determined in consultation with the Airport and Transport Canada. The EY Centre and NRC are situated on Airport lands and are therefore members of the Agency and Business Consultation Groups for this project. Accordingly, they have regular opportunities to review the study process and identify any issues that may arise. 2.2 The study timeline indicated approval by the Minister in December 2015. Which Minister? Rail is a federal issue, but the province is also involved. 1 As a municipal endeavour, this project requires provincial EA approval, and the provincial Minister of the Environment will issue the decision regarding this EA. The study is following the Transit Project Assessment Process. 2.3 More information on these plans should be provided online. Transit riders have been looking for it for years. 1 Information on the current study is available at ottawa.ca/trilliumline. At the conclusion of the study, information on next steps will be provided by the City as it becomes available. 3.1 I support a new station at Gladstone. 4 Comment noted. 3.2 If the Gladstone overpass is near the end of its service life, the station should be centred on Gladstone, as this option will provide better passenger access. 2 Comment noted. There are affordability concerns associated with placing a station underneath the overpass. 3.3 The only logical place to put this station is underneath Gladstone Avenue, to provide access from both sides of the street. Safety is not a concern, as numerous Transitway stops were built under a roadway. 1 Comment noted. There are affordability concerns associated with placing a station underneath the overpass. 3.4 It is important to provide a good pedestrian connection between Gladstone Station and Preston Street, perhaps including a pedestrian bridge over the Trillium Line between Gladstone and Somerset. The station plaza should continue east all the way to Preston Street. 1 Comment noted. The draft Gladstone CDP envisions a future pedestrian bridge between Gladstone and Somerset. The CDP also consulted with community stakeholders to determine an appropriate size and location for the station plaza. 3.5 It is important to ensure safe pedestrian crossings of Gladstone at the station. 1 The functional design developed as part of the Recommended Plan identifies pedestrian crossings at Gladstone. These crossings will be developed further during the preliminary and detailed design stages of the project. 3.6 This station should be built with twin tracks that connect to the main line and passing tracks to the north, to permit efficient train operations. 1 Comment noted and under review as part of the functional design. 4.1 I support moving Confederation Station to the other side of Heron Road if cost is not an issue for the City and if it will serve the future community better. 1 Comment noted. 4.2 Future development in the station area seems too far off to justify moving the station at this time. Even if redevelopment occurs, it is a short walk from the existing station. 5 The station will not be moved until redevelopment north of Heron Road offers the potential for a relocated station to better serve the community. As the existing station is in an isolated location, a new location will offer improved pedestrian connections. 4.3 PWGSC should be responsible for the cost of moving the station. 1 Comment noted. 4.4 The station should be placed under the overpass. This will be more expensive, but the overpass will need to be replaced in the future anyway. Safety is not a concern, as numerous Transitway stops were built under a roadway. 2 Comment noted. There are affordability concerns associated with placing a station underneath the overpass. 4.5 Any relocation of this station should be designed for convenient transfers to/from Heron Road bus routes. 1 Comment noted and under review as part of the functional design. 4.6 To help cover any increased costs associated with building the station close to Heron Road to facilitate bus transfers, the City could consider building the station as part of a mini-mall near Heron Road, and recoup construction costs through rent. 1 Comment noted and under review as part of the functional design. 4.7 Any relocation of this station must include good pedestrian access through the existing underpass. 1 Comment noted and under review as part of the functional design. 4.8 This station should incorporate a Kiss and Ride drop-off area accessible from Heron Road, so that drivers do not stop on Heron to let passengers out. Enforcing no-stopping zones without a designated stopping zone will simply inconvenience potential passengers and negatively affect ridership. 1 Comment noted and under review as part of the functional design. 4.9 To eliminate confusion for visitors to Ottawa, this station should be re-named, as it is not on the Confederation Line. “Riverside Park” would be an appropriate name. 2 Comment noted. 5.1 I support a new station at Walkley. 5 Comment noted. 5.2 A station at Walkley will significantly improve travel times from this area to the west end, as it will eliminate the need to take a bus through downtown. 1 Comment noted. 5.3 A platform on the east side of the track might allow for a long ramp to be added parallel to Walkley Road, similar to Confederation Station access; which could provide the redundant access required. 1 Comment noted and under review as part of the functional design. 5.4 The station should be placed under the overpass. This will be more expensive, but it will provide better station access. The overpass will need to be replaced soon anyway. Safety is not a concern, as numerous Transitway stops were built under a roadway. 3 Comment noted. There are affordability concerns associated with placing a station underneath the overpass. 5.5 There appear to be safety concerns associated with requiring users to cross Walkley off-ramp and Walkley Road to reach an elevator. However, the recommended option is financially prudent and closer to the hotel/condo complex. All crossings of Walkley Road can be made using signalized pedestrian crosswalks. 5.6 Car traffic at Walkley Station should be reduced to two lanes to allow safe passenger drop-off areas and safe walking/cycling approaches from both east and west. 1 Comment noted and under review as part of the functional design. 5.7 This station should incorporate a Kiss and Ride drop-off area accessible from Walkley Road, so that drivers do not stop on Walkley to let passengers out. Enforcing no-stopping zones without a designated stopping zone will simply inconvenience potential passengers and reduce ridership. 1 Comment noted and under review as part of the functional design. 5.8 Good platforms should be provided at Walkley Station for local bus transfers. Currently, buses often fail to stop for waiting passengers. 1 Comment noted. 5.9 Why is Kaladar Park being shut out of Trillium Line? The passing track has been installed between Confederation Station and the proposed Walkley Station, but pedestrian access from Kaladar Park to Walkley Station is non-existent. 1 Comment noted. 6.1 I support a new station at South Keys. 2 Comment noted. 6.2 It is essential that a South Keys transfer to/from the Airport Link be an easy cross-platform change (no stairs, elevator etc.) otherwise people will not use the service. 1 Comment noted and under review as part of the functional design. 6.3 I am pleased with the proposed station configuration. A second track is required at that location to allow for passing trains and efficient transfers between branches. 3 Comment noted and under review as part of the functional design. 6.4 The Study Team should consider moving South Keys Station further south so it is adjacent to Hunt Club Road, providing better access for bus transfers and car drop-off. 1 Bus transfers in this location currently take place at South Keys Station, rather than along Hunt Club Road. Station access must also consider walking distance from station to existing and future destinations within South Keys shopping centre, which is identified for future transit-oriented development. 6.5 Will Park and Ride be maintained at South Keys? 1 Park and Ride is currently prohibited at South Keys. The existing Greenboro Park and Ride will be maintained. 7.1 I support the preferred option at Lester Road. 1 Comment noted. 7.2 The freight rail crossing at Lester Road should not be at grade. 1 The low number of freight crossings per year does not warrant the expense of a grade separated crossing. 7.3 I am concerned that the Lester overpass is being built in a swamp, as it will likely result in cost overruns. 1 Impacts to the surrounding wetlands must be minimized as part of this project. The Recommended Plan will minimize these impacts to the greatest extent possible in a cost-effective manner. Ground conditions in the area are known and will be considered during the functional design. 7.4 It is not clear that the recommended option will be less expensive than simply putting all tracks on a structure over the road. 1 Preliminary cost estimates indicate that keeping the freight at grade will significantly reduce the cost of the structure and costs associated with minimizing environmental impacts to the wetland. 8.1 I support the preferred option at Leitrim Road. 1 Comment noted. 8.2 I am concerned that the 2.5% grade at Leitrim Road will cause unnecessary future limitations. The grade change should be more limited. 1 The recommended grade has been selected to meet City and vehicle requirements and strike the best balance between service flexibility and footprint impacts. 8.3 The preferred option has unacceptable impacts on property access. 1 Comment noted and under review as part of the functional design. 8.4 The preferred option blocks wildlife movement across Leitrim Road. 1 Comment noted. 8.5 The preferred option will need to be removed when the Airport’s new runway is built and Leitrim is realigned; it appears to be a throwaway cost. 1 The Study Team recognizes that this grade separation may only be in place for the short term. This option was chosen because it has a relatively low cost and will allow the realignment of Leitrim Road with no changes to the rail line. 8.6 Leitrim Road should be realigned now, eliminating the throwaway cost of a Leitrim grade separation and permitting development on Airport lands along a realigned Leitrim and re-opened High Road. Trillium Line tracks could be kept at the same elevation through the ridge, allowing High Road and a MUP to cross over top. If High Road is reopened, Bowesville Road can be closed, eliminating the need for another grade separation. 1 The realignment of Leitrim Road will require an environmental assessment process that has yet to begin. The high water table in the study area will limit the potential for cut sections of track. 10.1 I support the preferred option at Bowesville Station. 1 Comment noted. 10.2 Bowesville Station should be east of Bowesville Road to permit N-S through traffic on Bowesville. 1 Comment noted. 10.3 Bowesville Station should be west of Bowesville Road to get the station as close to Riverside South as possible and be compatible with the Barrhaven-Riverside South Rapid Transit plan. Given that station access is exclusively from Bowesville Road, it makes no difference to users what side of the road the station is on. However, eliminating a grade separation results in significant cost savings. This is not a significant departure from the plan approved as part of BRRT. 10.4 Size of Park and Ride seems excessive and seems to encourage a car focus. 1 Size was determined as part of citywide study evaluating future travel demand. Intent is to minimize number of cars travelling into downtown core by facilitating a switch to transit. 10.5 Bowesville Station does not seem appropriate at this stage. People will not be interested in using the Park and Ride. It seems to make more sense to extend the line into Riverside South instead of building stations at Leitrim and Bowesville. 1 The line cannot be extended into Riverside South prior to electrification, as there are technical and regulatory barriers to building a diesel rail line in a transit-oriented, urban context [see item 1.X]. Modelling work completed as part of the 2013 TMP update indicates travel demand that will support a Park and Ride at Bowesville. 10.6 Not clear what destinations are being served by the O-Train south of South Keys. 1 The Trillium Line is being extended to Leitrim and Bowesville to provide rapid transit service to and from downtown for residents of the adjacent communities as well as commuters from areas south of the City. 11.1 I am pleased with the plans for the Airport Link. 5 Comment noted. 11.2 Airport rail service is an important element of this plan and should be built as soon as possible. 9 Comment noted. 11.3 The Airport Link will compromise rail service to and from communities in south Ottawa. 1 The operating model will be chosen to provide the best possible service to Riverside South. 11.4 The proposed alignments (branch lines) provide poor access for passengers wishing to travel between Bowesville and the Airport, because they are required to transfer. 2 The recommended operating model has been chosen to minimize transfers at the peak periods associated with each destination. 11.5 The Study Team should consider a wye at the Main Line – Airport Link junction, so that trains can run directly between Bowesville and the Airport, and from Bayview to Bowesville via the Airport. 3 Passenger demand between Bowesville and the Airport is projected to be too low to make a Bowesville-Airport service viable. Passenger delay (5-8 minutes) is likely too long to make an Airport Loop service viable. 11.6 As not all airline travellers are going to/from north of the Airport, a shuttle service from Park and Rides, operated by the Airport Authority on a user-pay basis, would be more cost-effective and serve a greater number of potential users. 1 Comment noted. 11.7 The Airport and EY Centre should contribute to the cost of the Airport Link. 2 Comment noted. 11.8 As a taxpayer, I support funding for the Airport Link. 1 Comment noted. 11.9 The Airport Link will be both more reliable and more affordable than taxi service from downtown. 1 Comment noted. 11.10 To be a viable option for travellers to/from Vanier, the Airport Link would need to be faster than the current bus travel time of 45 minutes and 1 connection. 1 Comment noted. 11.11 After Airport rail service is implemented, bus service options to Kanata, Orleans and Barrhaven should be implemented. 1 Ridership numbers are unlikely to support direct service between the Airport and these areas. South Keys Station is intended to act as the transfer point for service east, west and south. 11.12 The proposed Airport Parkway and Lester Road realignments should be built before the rail, to minimize construction delays along the rail line and promote adjacent development as envisioned by the Airport. An interim diesel line could then be built along the existing Airport Parkway. The ultimate rail line adjacent to the realigned Airport Parkway can be built after electrification, which would eliminate the need for grade separations and preserve the continuity of the road network. 1 The City intends to extend rail in advance of the road as an incentive for transit use. An interim diesel line would also require grade separations at Uplands and the Airport Parkway and would not make effective use of the existing rail corridor. 12.1 The station near the EY Centre should be as close to the building as possible, and incorporate covered/enclosed walkways to encourage use. 1 The EY Centre station is being planned in conjunction with the proposed Airport Parkway realignment and the potential expansion of the EY Centre. Pedestrian access to the EY Centre is a significant consideration in this planning. 13.1 I like the idea of an elevated Airport Terminal station. 1 Comment noted. 13.2 It is important for the Airport terminal station to be located at the terminal building. Users should not need to walk a long distance to reach the terminal. 3 Comment noted. 13.3 It is important for the Airport Terminal station to have a fully enclosed, climate-controlled link to the terminal building. 1 Comment noted. 13.4 The Airport Terminal station should be on the terminal side of the tracks. This would permit users to access departures directly by crossing the road, or going down one level and using the elevated walkway. Users will expect to be able to arrive by train and go directly to departures without carrying luggage down stairs. 1 Comment noted. 13.5 Placement of the Terminal station on the departures level may make it less visible to arriving tourists. 1 Comment noted. 13.6 The Airport Terminal station only needs to serve the main terminal, as Transport Canada regulations now require that all carriers process their passengers and crew through the central terminal. 1 Comment noted. 14.1 I am concerned that the expanded plan cannot actually deliver 8-minute service frequency, as the most recent announcements have indicated 9-minute frequency along the main line, without Gladstone and Walkley stops. 1 Comment noted and under review as part of the functional design. 14.2 I support the mixed operating model. Bowesville should have priority at rush hour, with Airport priority at other times. It is smart planning and a good compromise given the constraints. 3 Comment noted. 14.3 I support the dual service overlay, because it does not require transfers to reach the Airport at any time of day. 3 Comment noted. 14.4 Airport passengers should not need to transfer to another train. Direct service should be required. 3 Comment noted. 14.5 I am concerned that the mixed operating model will be confusing for riders. 2 If the mixed operating model is chosen, train and station signage and published schedules will communicate the required information. 15.1 A MUP along the corridor is a good idea. 1 Comment noted. Current City policy is to provide MUPs along rapid transit corridors. 15.2 A better connection is needed between Bayview Station and the Ottawa River Pathway. 1 A new pathway between Bayview Station and the river was opened in 2013. Additional pathways on the east side of the current bus station are outside the scope of this project. 15.3 Consideration should be given to integration and potential expansion of the existing north-south O-Train pathway. 2 Comment noted. 15.4 Future MUPs should be the same as the existing one in terms of design, lighting, and snow removal. 1 Comment noted. 15.5 I support a MUP on both sides of the corridor near Gladstone. 1 The Gladstone Station District CDP envisions a MUP on the west side of the corridor. The City will require private developers of these parcels to include it in their site plans. 15.6 Carling Station should be placed underneath the overpass, providing access from both sides of the street. Safety is not a concern, as numerous Transitway stops were built under a roadway. 1 Modifications to Carling Station are beyond the scope of this project. 15.7 A better pedestrian/cycling connection should be provided in front of the O-Train station at Carling Avenue, as crossing Carling in that location is difficult. This project should take advantage of the opportunity to improve the rail-bus transfer at Carling Station. 3 Modifications to Carling Station are beyond the scope of this project. 15.8 It seems unnecessary and shortsighted for the MUP to cross to the east side of the rail line between Confederation Station and the Rideau River. Consider moving it to the west side. 1 Comment noted. 15.9 There should be a MUP connection between Sawmill Creek and Greenboro Station. 1 Modifications to Greenboro Station are beyond the scope of this project. 15.10 The lack of dedicated MUP crossing at Hunt Club is dangerous. Pedestrians and cyclists will not take the detour shown in the plan. If there is no room on the rail structure, consider using the Transitway bridge, with access from the South Keys underpass. 1 Comment noted and under review as part of the functional design. 15.11 The proposed Hunt Club crossing is unacceptable. Better options include cantilevering a MUP beside the existing rail line on the existing bridge (preferred) or installing a pedestrian crossing at the intersection underneath the existing bridge. 1 Comment noted and under review as part of the functional design. 15.12 Completing a MUP link between the existing MUP that ends at Hunt Club and the Osgoode Trail that ends at Leitrim should be a high priority. 1 Comment noted and under review as part of the functional design. 15.13 The south area is rural in heritage. There is a horse facility off Albion near Lester [Greenbelt Riding School], which currently has pathway access. Any MUP bridge should include a means to get to ground level and cross at a light or when the way is clear. Otherwise, a safety barrier 3 m high is needed. An access ramp on either side would also provide pathway access from people from the Albion/Lester area. Bollards would need to be wide enough to allow a horse to pass. 1 Comment noted and under review as part of the functional design. 15.14 I like the idea of extending the pathway to Bowesville, but it is important that this pathway be well-maintained and monitored for safety purposes. 1 Comment noted. 15.15 The design will need to consider safety on the multi-use pathways, particularly at road intersections, and how they will connect with other paths. 1 Comment noted. 16.1 I expect more rigorous analysis of impacts on wetlands, creeks and forested areas than was presented at the Public Open House. There should be more to this EA than where to put the platform. 1 The evaluation of alternatives has considered any significant differences in environmental impacts between alternatives. The functional design will include a full analysis of all environmental impacts and proposed mitigation measures. The evaluation and analysis will be fully documented in the Environmental Project Report to be made available for public review during the TPAP. 16.2 I am concerned about preserving and enhancing connectivity for wildlife. 1 The Study Team is working with the NCC to provide appropriate wildlife crossing facilities within the Greenbelt. Appropriate crossings for wetland animals, as identified by the City, will be provided in the vicinity of Lester Road. 16.3 I am concerned about potential impacts to wetlands of the Main Line and/or Airport Link. 1 The Recommended Plan minimizes wetland impacts and includes mitigation measures for any remaining impacts. These are documented in Section ## of the EPR. 16.4 Study team should be aware that MNR has a report that implies a larger Lester Road wetland than the currently designated PSW. 1 Comment noted. 17.1 There does not appear to be a need to take land for a yard at Bowesville. 1 The Study Team is working with Capital Rail to determine a preferred maintenance yard solution, which may be located at Bowesville. The recommended option will be documented in the Recommended Plan. 17.2 Bowesville yard should be built as soon as possible, as it will save lease payments to the CPR. 1 The Study Team is working with Capital Rail to determine a preferred maintenance yard solution, which may be located at Bowesville. The recommended option will be documented in the Recommended Plan. 18.1 Designs should incorporate pleasant approaches to each station on foot or by bicycle. 1 Comment noted. Pedestrian and cycling connectivity is a major consideration in the functional design of each station. 18.2 Real-time notification of service disruptions should be provided. 1 Comment noted. 18.3 Each station should incorporate a passenger drop-off area. 1 Comment noted and under review as part of the functional design. 18.4 Station design must consider weather protection, including for people transferring from buses. 1 Comment noted and under review as part of the functional design. 18.5 There should be a well-planned bus/train transfer process at all stations. 1 Comment noted and under review as part of the functional design. 18.6 Washrooms should be provided at major stations. 1 Comment noted and under review as part of the functional design. 18.7 Stations should have cameras and be monitored in an obvious way, so off-peak users feel safe. 1 Comment noted. Stations will be designed according to CPTED principles and be monitored according to OC Transpo standards. 19.1 Where will passing sidings be located? How much of the line will be single track? 2 Passing siding locations will be determined as part of the functional design. 19.2 The entire Trillium Line should be double-tracked to optimize service frequency and reliability. 1 Modelling undertaken as part of the 2013 TMP update found that 2031 travel demand can be met using a single-track line with passing sidings. A fully double-tracked line is not considered cost-effective at this time. 19.3 Passing sidings at Walkley and Gladstone should be extended to permit dual-platform stations at Walkley and Gladstone. This would reduce the potential for one train’s delays to affect the other. 1 The location of passing sidings will be determined during functional design to permit the desired operating frequency with appropriate extra capacity to reduce delay. 19.4 The ‘flip-up extenders’ to be used along the Greenboro and South Keys Station platforms increase the amount of manual labour required when a freight train is to pass and limit them to overnight trips only. The Study Team should consider adding a separate gauntlet track or adding additional switches and passing tracks at the stations. 1 Comment noted and under review as part of the functional design. 19.5 No passing sidings are shown south of Greenboro Station. Is it correct to assume that the future frequency of 8 minutes will not apply south of Greenboro Station? 1 Passing siding locations will be determined as part of the functional design to provide 8-minute service frequency to Bowesville. 20.1 Study Team should consider electrifying the line now, rather than in the future. 2 Electrification will require significant infrastructure investment and is not required to meet projected 2031 transit travel demand. It is considered a long-term solution. 20.2 Initial implementation of the Recommended Plan should be designed to minimize throwaway costs when the line is converted to twin-track electric LRT. 1 Throwaway costs were considered in the evaluation of alternatives. 20.3 Once electrified, the Trillium Line should be fully integrated with the Confederation Line. 1 This issue will be examined in the future, when the line is converted to electric LRT. 20.4 There does not appear to be an easy way to electrify the line without an extensive service shutdown. 2 Comment noted. 20.5 If electrification is prohibitive, the Study Team should plan to accommodate 2-car trains to provide enough capacity. This may require reconstruction of existing stations. 1 The Recommended Plan includes sufficient platform space to permit their potential future expansion to accommodate larger trains. 21.1 The City should not be funding expanded roads to the Airport when a well-built transit system could accommodate these travellers. It is not clear that negative impacts from a wider road (increased costs, habitat loss, aesthetic impacts, etc.) are worth the convenience. 2 The Airport Parkway / Lester Road Widening EA is a separate study proceeding concurrently with this study. These comments have been forwarded to the project team. 21.2 The lack of a Confederation Line station at Confederation Square is a colossal error in judgment. 1 Comment noted. This issue is beyond the scope of the current study. 21.3 The Beechwood/Vanier area has been forgotten in the City’s rapid transit network plans. For residents to use the network, frequent and fast all-day service is needed in and out of the area (e.g. light rail on Rideau/Beechwood). 1 Comment noted. This issue is beyond the scope of the current study. 21.4 There is a high degree of skepticism that these consultation events pay attention to citizen concerns. 1 Comment noted. This issue is beyond the scope of the current study. The City of Ottawa is developing a plan to extend and expand the City's existing diesel-powered O-Train Trillium Line service from Greenboro Station to Riverside South (Bowesville Road) and to the Ottawa Macdonald-Cartier International Airport. The plan will include options to service the growing communities of Riverside South and Leitrim, the Airport and adjacent lands, new stations at Gladstone Avenue and Walkley Road and a relocated station at Confederation Heights on the existing Trillium Line. The plan also allows for future conversion to electric light rail transit (LRT) technology. The planning efforts have been completed and the City is now formalizing the environmental assessment component in accordance with the Transit Project Assessment Process (TPAP) as prescribed in Ontario Regulation 231/08. As part of the TPAP, an Environmental Project Report (EPR) will be prepared to document the entire study process, a description of the planned project, its anticipated environmental impacts, as well as the project's consultation program. Members of the public are invited to review the work completed to-date, including previous consultation efforts and reports presented to City Council on this project during the planning phase. Comments can be forwarded to the City between September 24, 2015 (date of first TPAP notice) and October 31, 2015. In early 2016, the draft EPR will be made available for public review and notification will be issued. This study was initiated by the City of Ottawa to develop an approved plan to extend and expand the City's existing diesel-powered Trillium Line (O-Train) service from Greenboro Station to Riverside South (Bowesville Road) and to the Ottawa Macdonald-Cartier International Airport. The plan will include options to service the growing communities of Riverside South and Leitrim, the Airport and adjacent lands, as well as new stations at Gladstone and Walkley roads on the existing O-Train line. The plan also allows for a future conversion to electric light rail transit (LRT) technology. The study is comprised of two parts. Part A of the study addresses the main line extension to Riverside South (Bowesville Road), including new stations at Gladstone and Walkley roads. Part B of the study addresses a potential Trillium Line spur line connection to the Ottawa Macdonald-Cartier International Airport. Note that Part A of the study has been identified by Ottawa City Council as part of the City's Stage 2 affordable LRT plans to be implemented in the near term. 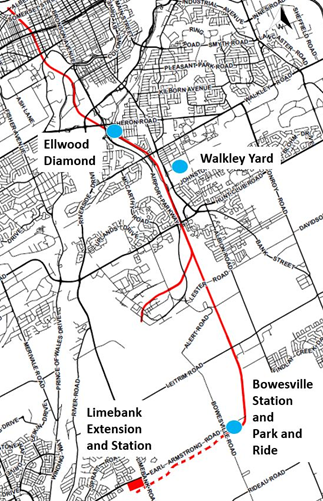 The primary study area includes the existing Trillium Line corridor between Bayview and Greenboro Stations, the current Walkley Yard maintenance and storage facility, the proposed southern extension from Greenboro Station to Riverside South (Bowesville Road), and a branch to the Airport, as shown below. Why extend the Trillium Line to Bowesville (Part A)? The need to extend rail transit service to Riverside South and further to Barrhaven was first identified in the City's 2003 Transportation Master Plan (TMP). This need was driven by planned population growth in the south urban community: a projected 54,600 residents and 27,900 jobs in Riverside South and 22,500 residents and 12,600 jobs in the South Nepean Town Centre when these communities are fully built out. To meet this demand, in 2006 the City's North-South Corridor LRT EA Study (N-S LRT EA) identified an approved recommended plan to extend electrically powered rail transit from the Rideau Centre to Barrhaven Town Centre. The City's updated 2013 TMP identifies construction of the electric LRT line south of Bayview Station as something which will likely take place beyond 2031. In order to provide an immediate benefit to transit riders from the growing communities south of the Airport, the City plans to extend the Trillium line to a Park and Ride and transfer station near Bowesville Road, and to construct a Bus Rapid Transit (BRT) Transitway facility linking Bowesville with Barrhaven Town Centre through Riverside South. Bowesville Station was identified as the preferred end point for an O-Train extension in the Trillium Line South Rail Expansion Project Feasibility Study, which was presented to City Council in 2012. EA approval for the Transitway portion was obtained through the Barrhaven – Riverside South Rapid Transit (Barrhaven Town Centre to Leitrim Park and Ride) Environmental Assessment Study (BRRT) in 2013. What is the current study process? This study is following Ontario's Transit Project Assessment Process (TPAP) (O. Reg. 231/08), which is approved under the Ontario Environmental Assessment Act. Under the TPAP, the City must consider alternative designs for the transit project, undertake public and agency consultation, assess the potential environmental impacts of the recommended plan, and identify measures to mitigate these impacts. The study will also address potential implications of federal and National Capital Commission properties and the potential requirements for federal permits and funding. As part of the study process, an Environmental Project Report (EPR) will be prepared for public review. Following the public review period and the issuance of a Notice to Proceed from the Minister of the Environment, the project will be considered to have EA approval and may proceed towards financing and construction. The EA process requires a comprehensive consultation program involving many stakeholders, including the City of Ottawa, the Airport, the NCC, approval and regulatory agencies, local community associations and businesses, special advisory and interest groups and members of the public. The study is expected to take approximately 15 months to complete. You are encouraged to participate in the study by attending consultation events or contacting the study team directly with information, comments or questions. Updated project information will be posted periodically on the study website. An Open House will be scheduled as an opportunity for interested persons to learn about the study and provide input on the recommended plan or any other aspect of the study. Notification for the open house will be provided through local newspaper notices, emails to the study mailing list, and postings on this website. The City of Ottawa has initiated an Environmental Assessment Study to develop an approved plan to extend the City's existing diesel-powered Trillium Line (O-Train) service from Greenboro Station to Riverside South (Bowesville Road), as well as a branch line to the Ottawa Macdonald-Cartier International Airport and new or relocated stations at Gladstone Avenue, Confederation Heights and Walkley Road. The study is being undertaken in accordance with the transit project assessment process as prescribed in Ontario Regulation 231/08, Transit Projects. The primary study area includes the existing Trillium Line corridor between Bayview and Greenboro Stations, the current Walkley Yard maintenance and storage facility, and the proposed southern extension from Greenboro Station to Riverside South (Bowesville Road) and the Ottawa International Airport. The plan will include options to serve the growing communities of Riverside South and Leitrim, the Airport and adjacent lands, as well as new or relocated stations at Gladstone Avenue, Confederation Heights and Walkley Road on the existing Trillium line. The plan also allows for a future conversion to electric light rail transit (LRT) technology. The Trillium Line extension is one of three environmental assessment studies underway as part of Stage 2, the City's plan to extend the benefits of rail to residents further east, west and south that will add 19 new stations and 35 kilometres to our LRT network. If you are not available to attend the Open House or would like additional information, please visit the study web site at ottawa.ca/trilliumline or direct your comments and questions to the contact person below. The Open House presentation material will be posted to the study web site. In 2014, the City of Ottawa initiated a Planning and Environmental Assessment (EA) Study to develop a Recommended Plan for the extension of the diesel-powered Trillium Line (formerly O-Train) from its current terminus at Greenboro Station south to Riverside South (Bowesville Road) and to the Ottawa Macdonald-Cartier International Airport. The plan includes options to service the growing communities of Riverside South and Leitrim, the Airport and adjacent lands, as well as new stations at Gladstone Avenue and Walkley Road on the existing Trillium Line. The plan also allows for future conversion of the Trillium Line to electric light rail transit (LRT) technology. The study consists of two parts. Part A includes the main line extension to Riverside South (Bowesville Road), including new stations at Gladstone and Walkley, and Part B includes a branch line to the Ottawa Macdonald-Cartier International Airport. Note that Part A of the study has been identified by Ottawa City Council as a component of the Stage 2 LRT plan, to be implemented in the near term. The study area includes: the existing Trillium Line corridor between Bayview and Greenboro Stations; the current Walkley Yard maintenance and storage facility; the proposed southern extension from Greenboro Station to Riverside South (Bowesville Road); and the proposed branch line to the Airport, as shown in Figure 1. The planning phase of the study concluded with City Council approval of the Recommended Plan on July 8, 2015. The approvals phase of the project is initiated by a Notice of Commencement issued by the City on 24 September 2015. The objective of this phase is to obtain provincial approval for the Recommended Plan through the Transit Project Assessment Process (TPAP) (O. Reg. 231/08). Details on the TPAP are available on the Ministry of Environment and Climate Change (MOECC) website. New multi-use pathway segments and grade-separated crossings to provide a continuous facility along the length of the extension. The staff report to Council is available online. Anticipated environmental impacts and proposed mitigation measures were presented at the Open Houses on January 13 and 15, 2015. Copies of the display material are available on the City's website. Impacts, mitigation measures and monitoring requirements will be detailed in the EA documentation and confirmed/refined in future design phases of the project. While comprehensive consultation efforts have already taken place since the study's initiation in 2014, and City Council has approved the Recommended Plan, the TPAP process allows for an additional period of review of all work completed to date. Interested persons are encouraged to review the project materials and contact staff directly with comments or questions. The deadline for feedback is October 31, 2015. In early 2016, the City will release the Environmental Project Report (EPR) for a final 30-day public review. A Notice of Completion will be advertised to mark this milestone. The City of Ottawa has completed an Environmental Project Report in accordance with Ontario Regulation 231/08 for the Trillium Line Extension Planning and Environmental Assessment study. The City of Ottawa has developed a plan to extend and expand the City's existing diesel-powered O-Train Trillium Line service from Greenboro Station to Bowesville Road and to the Ottawa Macdonald-Cartier International Airport. The plan includes options to service the growing communities of Riverside South and Leitrim, the Airport and adjacent lands. The plan also incorporates new stations on the existing line at Gladstone Avenue and Walkley Road and a relocated station at Confederation Heights. Impacts to private property are anticipated to be limited to the areas adjacent to the proposed Lester Road and Leitrim Road grade separations. The environmental impact of this transit project was assessed and an Environmental Project Report (EPR) prepared according to the Transit Project Assessment Process as prescribed in Ontario Regulation 231/08, Transit Projects and Greater Toronto Transportation Authority Undertakings. The EPR documents the entire study process, including a description of the planned project, its anticipated environmental impacts, and the project's consultation program. The transit project may have a negative impact on a constitutionally protected Aboriginal or treaty right. Before exercising the authority referred to above, the Minister is required to consider any written objections to the transit project that he or she may receive within 30 days after the Notice of Completion of the Environmental Project Report is first published. If you have discussed your issues with the proponent and you object to the project, you can provide a written submission to the Minister of the Environment no later than February 21, 2016 to the address provided below. All submissions must clearly indicate that an objection is being submitted and describe any negative impacts to matters of provincial importance (natural/cultural environment) or Aboriginal rights. If not otherwise provided, a copy of the objection will be forwarded to the proponent by the ministry. Under the Municipal Freedom of Information and Protection of Privacy Act (MFIPPA), personal information included in a submission to the City of Ottawa will not be disclosed to any third parties without having obtained the prior consent of the person to whom the information pertains, except when MFIPPA permits disclosure or other applicable law requires that the City disclose the personal information. Direct submissions to the Ministry of the Environment and Climate Change are subject to the Freedom of Information and Protection of Privacy Act and the Environmental Assessment Act. Unless otherwise stated in the submission, any personal information such as name, address, telephone number and property location included in a submission will become part of the public record for this matter and will be released, if requested, to any person. Ellwood Diamond Grade Separated Crossing: The existing Trillium Line between Greenboro Station and Mooney’s Bay Station crosses a VIA single track alignment at-grade at a location known as Ellwood Diamond. A grade-separated LRT alignment is being recommended at the VIA alignment before connecting to the existing Mooney’s Bay Station. Walkley Yard Maintenance and Storage Facility (MSF): It was determined that the construction of a MSF on City owned land, west of Albion Road, would be preferred to renovating and expanding the existing Trillium Line Walkley Yard MSF. The analysis suggests that when property acquisition, potential remediation activities, and retrofitting required at the current Walkley Yard facility are factored in, the alternative site west of Albion Road would be less costly and provide the most opportunity for an innovative and efficient MSF design. Bowesville Station and Park and Ride: A new alignment will move the current Bowesville Station to the edge of the urban boundary just southeast of the intersection of Earl Armstrong Road and Bowesville Road. The new Earl Armstrong/Bowesville Station will be an at-grade station with a Park and Ride. A bus loop and layup area will be located at the east end of the station. This new alignment will take advantage of an existing rail corridor and reduce the environmental impact on sensitive lands further north. Limebank Extension and Station: In September 2017, Council approved the Stage 2 Light Rail Transit (LRT) Project and Procurement Update Report, which added into the procurement scope the possibility of a further extension of the Trillium Line from Bowesville Station to Limebank Road. This allows LRT to be better integrated with the community of Riverside South as it grows. The Limebank Extension will add approximately three kilometres of rail and an additional station west of Limebank Road. The change to the transit project may have a negative impact on a constitutionally protected Aboriginal or treaty right. Before exercising the authority referred to above, the Minister is required to consider any written objections to the change to the transit project that he or she may receive within 30 days after the Notice of Environmental Project Report Addendum is first published. If you have discussed your issues with the proponent and you object to the identified change to the project, you can provide a written submission to the Minister of the Environment no later than October 10, 2018 to the address provided below. All submissions must clearly indicate that an objection is being submitted and describe any negative impacts to matters of provincial importance (natural/cultural environment) or Aboriginal rights. If not already provided, a copy of the objection will be forwarded to the proponent by the Ministry: All personal information included in a submission – such as name, address, telephone number and property location – is collected, maintained and disclosed by the Ministry of the Environment, Conservation and Parks (MECP) for the purpose of transparency and consultation. The information is collected under the authority of the Environmental Assessment Act or is collected and maintained for the purpose of creating a record that is available to the general public as described in section 37 of the Freedom of Information and Protection of Privacy Act. Personal information you submit will become part of a public record that is available to the general public unless you request that your personal information remain confidential. For more information, please contact The City of Ottawa (contact information above) or the MECP Freedom of Information and Privacy Coordinator at 416-212-8912. This notice was first published on September 10, 2018. Minister's Notice to allow a change to a transit project in accordance with an addendum.